1 Place the prawns in a mixing bowl and add the garlic, ginger and olive oil. Cover and place in fridge to marinate. 2 Cook the rice mix according to packet instructions, set aside to cool. 3 Stir fry the prawns and set aside to cool. 4 Place the cooled rice mix in a large mixing bowl. Add the cooled beans, spring onions, chilli and coriander. 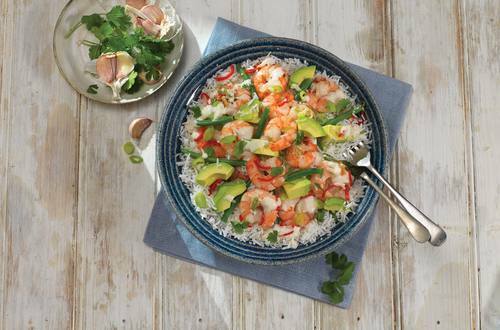 5 Pour 2 tablespoons of the Hellmann’s Coconut & Lime Dressing over the prawns, mix well and top with lime zest. 6 Add the remaining Hellmann’s Coconut & Lime Dressing to the rice and mix well. Chop the avocados and cover with lime juice. 7 Add the prawns and the avocado to the rice mix and fold in gently to serve.